BlogHop '08 continues through the weekend and you can link posts & continue visiting party-goers into next week. A $10 Burger King gift card will be awarded to one of the commenters to this post (drawing on Monday). 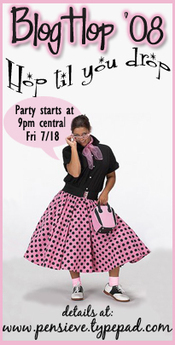 Check out Kelby's party--she's giving away some fabulous prizes! I cannot think of anything cooler than having a few dozen bloggers over to my home for a comfy meet and greet, complete with yummy eats & drinks as you arrive, and surcies as you say good-bye. Thank you for making time for our little bloggity soirée, especially when I have Martha Stewart rolling in her premature grave from such short notice (gasp!) compounded by me asking you to "bring" something (a party post--oh the horrors!). She'll have to get over it if she ever finds out. Since I s u g g e s t e d you might wanna keep your posts short and sweet to allow more time for visiting, I'll do the same. But, before I hop off to read your party posts, enjoy some treats--most of this spread was made from recipes from Snackalicious, a Super Bowl recipe extravaganza back in January. The one recipe I've gotta share is for Bacon Tomato Cups--though they're a bit labor intensive on the front end, they're more than worth the effort (click the name link for photos and step-by-step preparation). The quickest way for you to get to know me is to read my sidebar's "100 Things". Obviously it doesn't paint a complete picture, but it'll help you determine whether or not you want to subscribe to PENSIEVE or add it to your reader ;) (and, you KNOW I hope you do! :) ). That's all I've got for now...I've GOT to finish this post and get ready for our chat. Please read this post for instructions on how to join us--it really is EASY. THANKS TO THOSE OF Y'ALL WHO WERE ABLE TO MAKE IT! I'll be revising this post in the morning with links to some other chats and parties, so be sure to check back in! And last, I've gotta share the love: A HUMONGOUS SHOUT OUT to Karen, Simply...A Musing Blog and Simply Amusing Designs for her help with the stinkin' adorable BlogHop badge and for hosting our chat at Behind the Blog! Thanks, too, for those of you who helped get the word out on such short notice (let me know if I missed your announce post in this listing, and I'll add it as soon as possible): Fried Okra, Bunny Trails, Musings of a Housewife, World's Greatest Mommy, 123Pizza's Weblog, Kirtsy, and my co-lovah of fried chicken, BooMama. Y'all have my heart (not San Francisco!!)! Link away, girlieQs! Mix, mingle and HOP TIL YOU DROP!! This one time a dude clicked on a shorts ad...AND HIS LIFE WAS NEVER THE SAME. A FANTASTICAL One-day Sale for Mother's Day from Lisa Leonard!! Before Black Friday, there's Super Deal Monday & Gloriosity from Lisa Leonard!